I have an apron tutorial posted on Sew, Mama, Sew for their month of hand sewing. They have also posted an introduction in the contributors section. The apron is meant to be for children over seven years of age as it has real long ties that can tie in front on little children and they can carry lots of stuff in the four large pockets it has. 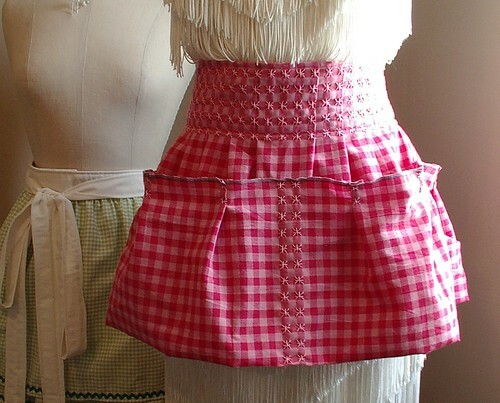 It also works nicely as a big persons apron for clothes pins or any thing else you can think to put in large pockets. If you want to make the above apron get yourself over to Sew Mama Sew and get all the directions . You do have to leave a way for me to get a hold of you too. Any one who doesn't leave a link to either an email, blog or flickr account or some other way of getting a hold of you will be disqualify as it is to hard for me to track down people otherwise. That is a really cute apron! I really like the top you made also. I like to see the new things you create. I guess really the only apron story I have is about my grandmother (my Mama's mother) she used to always make clothes and aprons. Well, she made this apron for my mama and the apron part was really big but the ties to tie it with were only about 6 inches each! It was such a hoot! It was too big around for my mama and you could barely tie it cause the ties were so short. I still have that apron. It is among one of my most prized possessions. Came via sew mama sew. I really don't have a apron story other than at Thanksgiving, I had a tea towel tucked in my apron and was to to use it so I stuck it(tea towel)in the turkey I was about 5 when I did this. We had turkey with tea towel and stuffing, still a running joke about my cooking. I love that apron! I came over today from the Sew, Mama, Sew! Blog. Last Thanksgiving, I purchased an apron at a craft fair for my stepmother. It was the first time that she was cooking "Family Thanksgiving." My apron story is from college. My mentor asked several of us college students if we'd be willing to help bless the men of our church by serving in the kitchen with her at a men's retreat in Arkansas. Before we left for the retreat, she gathered us around and gave each of us our own apron and a recipe card with an encouraging verse on it. So we took our aprons with us and had a blast cooking together and enjoying our time there. It was the first apron I ever had and when I use it I always think of our time in Arkansas and how much I love my mentor! I can remember my grandmother and her aprons. She worn them out. She always had the bid kind and pinned them to her top. That is a beautiful apron! 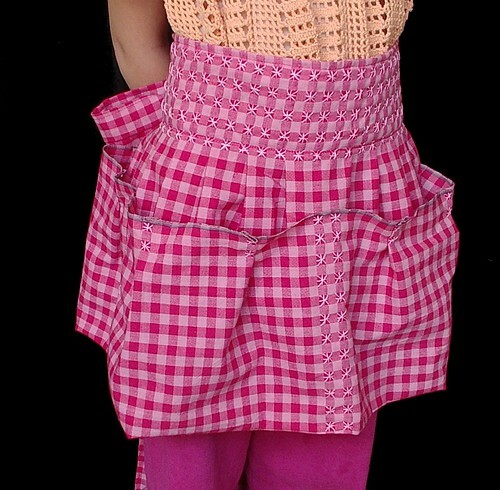 I was just thinking about buying gingham for another project. I can see I'll be trying some chicken scratch too now. I love this apron. It looks like it's duable. The only apron story I have is when I first made an apron, about 3 months ago. I followed the pattern directions but for some reason the top was too big. Even though you could tie the top up it didn't work. It looked more like a baby carrier/sling. I haven't made an apron since and I think I will just stick to 1/2 aprons from now on. I love this little apron great job! Well, funny you should ask. While waiting for my husband to have some minor surgery yesterday I was embroidering a baby sheet with a little bear on it. After realizing I did the inside of his ears the same color as the outside I decided to try and be a little more careful. However, in a little while I looked down and realized I had sewed the ribbon in brown too. I love the apron! The women in my family have passed down their aprons through the generations. They are so special and treasured. I can't wait to pass one onto my daughter! I've always wanted to try chicken scratch - this apron is a great project to start with! My story is about hand sewing, becoming a mom, and unrealistic expectations. When I was pregnant with our first child, I was put on bed rest at 12 weeks due to a placenta problem. It resolved after a few weeks, but with my new time as a stay at home "mom" I was looking for something to do. I started a cross stitch project, a sampler from a Beatrix Potter design book. I didn't realize when I started how teeny tiny the stitches were going to be. We're talking, I had to wear granny glasses to see where to stitch! I got about halfway through the border, before I gave up. Now, 5 years later, I have three kids and am never going to find the time to finish it! Sewing died with my mom's generation in my family, but I was enrolled in 4-H to learn to sew, which is weird because my Grandma who sews lived in the same town. Any ways, I taught myself to cross stitch and when I started dating my husband I taught my MIL to cross stitch and once I married her son she taught me how to quilt. And I love it! I pretty much love any sewing or handwork (embroidery, cross stitch, knitting, etc). What a cute apron! It turned out just great. When in a quilting class, we made aprons with our name on them to wear in class. For fun, a friend of mine brought one of her grandmother's vintage aprons. The top was so petite and narrow, that we all had a good laugh over how you had to decide which "one" you wanted to keep clean!!!! I also have a couple of aprons of my great-grandma's that are gingham with chicken scratch. I think that I am going to have to make some of these with my girls!!!! What a cute apron! My apron story is going on right now. I bought a dress from the salvation army for $2. I've cut the sleeves and bodice and am adding some fabric for a waitband/ties. It's coming out so cute but already my daughter says it's too long and looks too much like a dress so I guess I'm going to cut it. I've posted pics on my blog. I'm having fun with it and can't wait to try more aprons out! Hi, there, and thanks so much for sharing this with all of us - my grandmother (she just turned 99 this year) used to use this technique, but asking her to show me how to do this would be much too tiring for her...so I am very happy to find directions here. As for my apron-story...when my daughter was in Kindergarden, her class celebrated "restaurant day": the students would split up into "cooks" and "waiters", set tables, and make and serve lunch for the other Kindergarden-class. They democratically voted for a name ("the blue fish restaurant"), made their own decorations and menus for the place (formerly known as classroom). The evening before the "big day", I thought of how nice it would be if they all had little notebooks to take down orders, and aprons to match, so I headed out to the store at 6 pm to buy 20 tiny blank notebooks, and started cutting and sewing up aprons for all of the kids, complete with a blue fish appliquée'd onto a front pocket that held a pencil and the little book. My grandma always wore this thin cotton green apron when she was entertaining and a plain feed sack one the other times. A few times she accidently wore the green one "for company" over the plain "everyday" one--she'd forgottent to take it off first! When I was a child, my grandmother gave me an apron she made and wore as a child herself. It was so worn-out! Here is my apron story. One time in school we were doing a drama and I was the mother. I had an apron for my costume, but at some point I had twisted it around behind me (just a waist apron) to keep it out of the way. Well, I forgot to turn it around before I got onstage. I was mortified as 10 year olds tend to get over silly things like that. Your instructions are genious. Great job. I'd love to make one or win yours. I don't have very many apron stories, but I remember my mom always wore won. I used to keep one in my purse or diaper bag so I'd be ready to help out whenever I went visiting. Here's my embarrasing apron story: I try to fix myself up nice and often wear heels even to the grocery store. One time I found myself in the checkout line with a really cute outfit, makeup and hair done up and heels. The icing on the cake was an old raggy apron on top of it all. Ooops! When I was a little kid my mom tried to introduce my sister and I to sewing. The idea was to hand piece some quilt blocks. But before you can do any sewing you have to cut out the pieces. Well, I was on the floor too close to the rug. I was so into cutting out my pieces I didn't notice the rug. I cut off about half the tassels on one side of the rug before my mom noticed. Oops. I just love your pink "scratch" apron! !..The first time I ever saw "chicken scratch" was on a quilt in a show in Tyler TX..it was pale lavender and just glowed. My apron story is true. My natal family had many kids so it was a MUST to wear aprons as we ate dinner..one sister hated coleslaw so she would hide her serving in the pocket, til after dinner , and go flush it down the toilet. Guess she forgot one time and Mum discovered it, because the next set of aprons we all received had NO pockets; I still giggle at the memory. In junior high school, I was so excited to be able to take sewing class. Our first project was an apron. My grandma took me to Minnesota Fabrics to choose my fabric and sewing notions. It was a floral cotton. When it was finished and graded ( I got an A! ), I gave to Grandma. She used it until she passed away nearly 15 years later. Recently, I got that apron back. My mom found it in a box of grandma's things that was forgotten about in a hidden corner of the basement. I've had a good time reading everyone else's apron stories. What an adorable apron! My favorite memory story is gathering wood chips for kindling with my grandmother's huge comfy apron. Thanks for doing this, Wendy. I really need an apron so I can feel more like baking. My apron story isn't funny, I'll tell it anyway. In 8th grade I took a home-ec class and we were sewing aprons one day. While there, the principal came in and told me that my grandfather had died. I was crying and crying. The girls surrounded me to give me comfort, but the teacher knew better. She said, "Just leave her alone and let her sew her apron!!!" I sewed and sewed and cried and cried. I finished the apron that class. It was very theraputic.